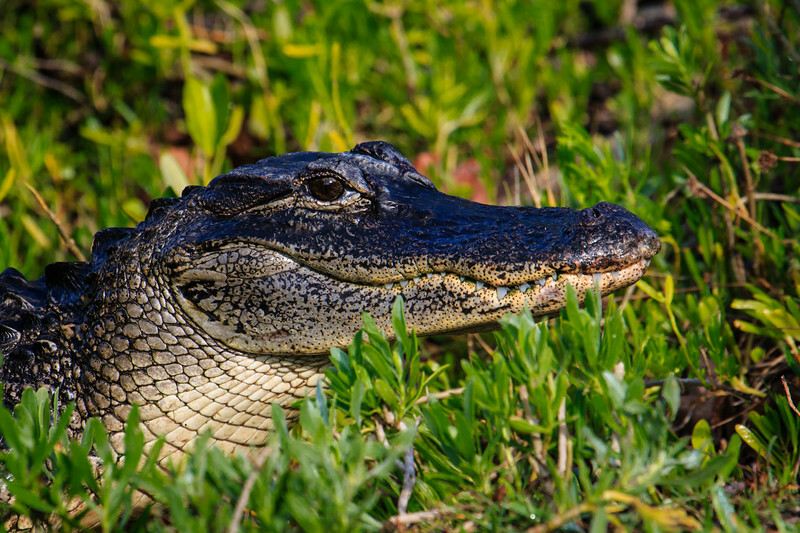 These are pictures from Southwest Florida, Big Cypress and the Everglades National Parks. 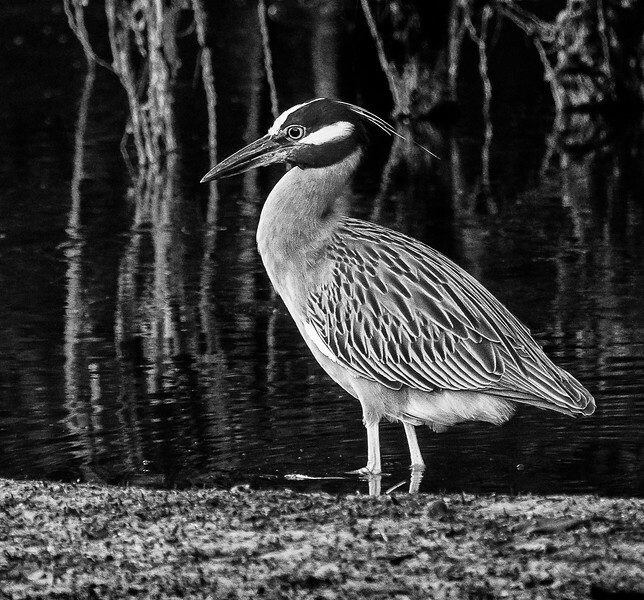 Florida is a haven for wildlife photography. 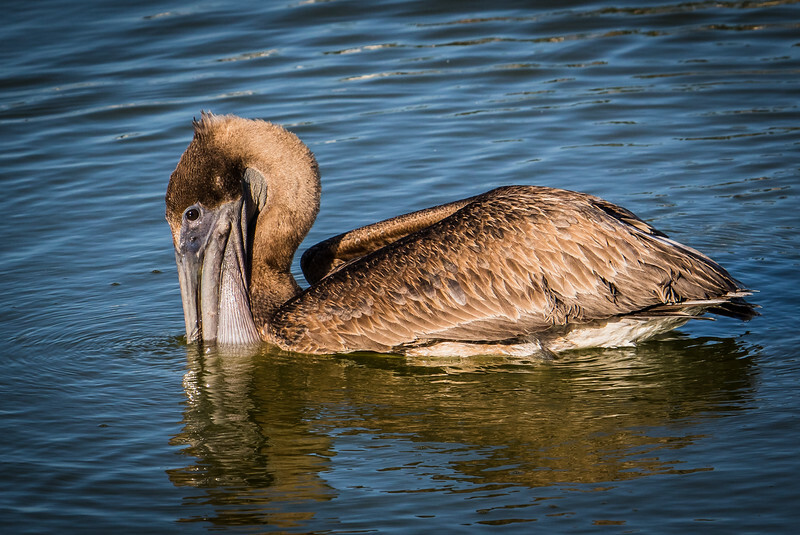 This one was swimming around by a fishing dock in Everglades City looking for food. 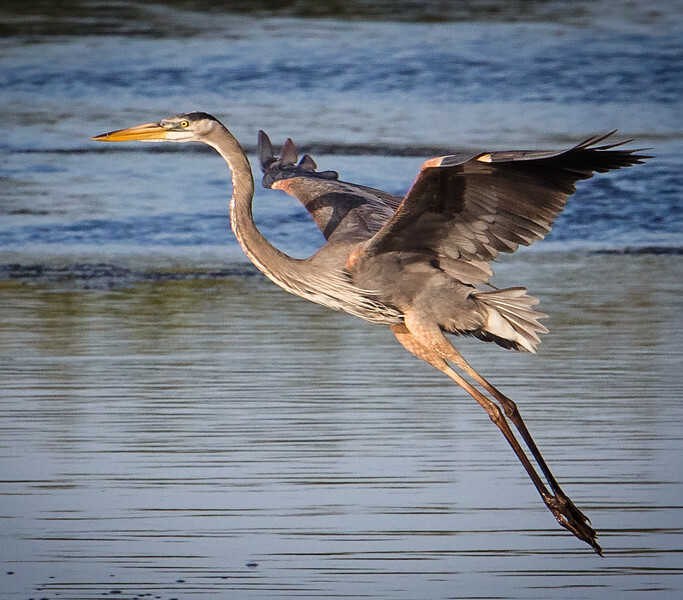 They will often fly over and then plunge headlong into the water in pursuit of a fish. 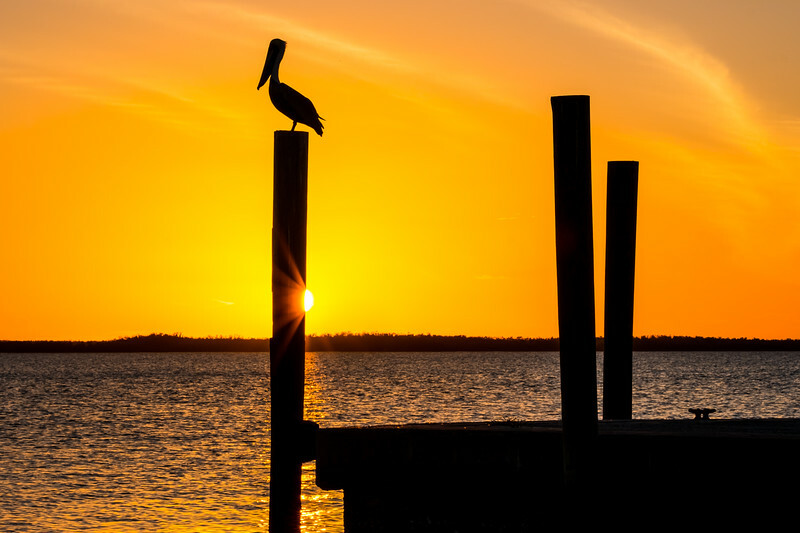 This brown pelican posed to make a nice silhouette for the sunset. 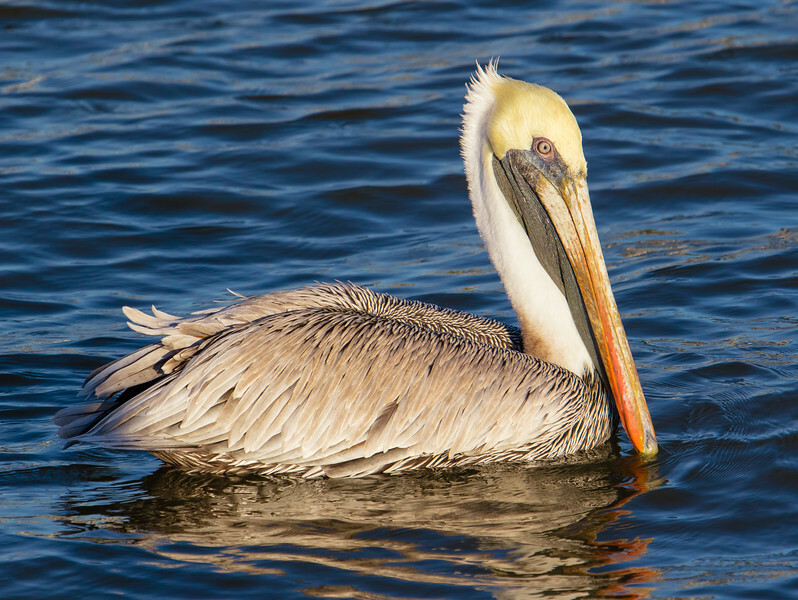 These are amazing creatures, standing about four feet tall and having a wingspan of six feet across. The neck can be folded into an S curve like this or can also extend straight upwards when on alert. 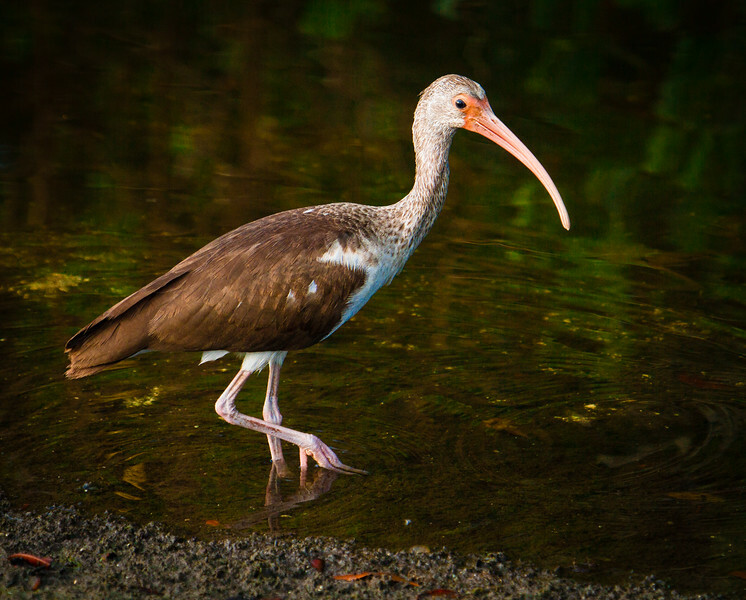 The thick spear-like beak enables its fierce hunting capability. It was all very quick, and he came up with a good-size fish. 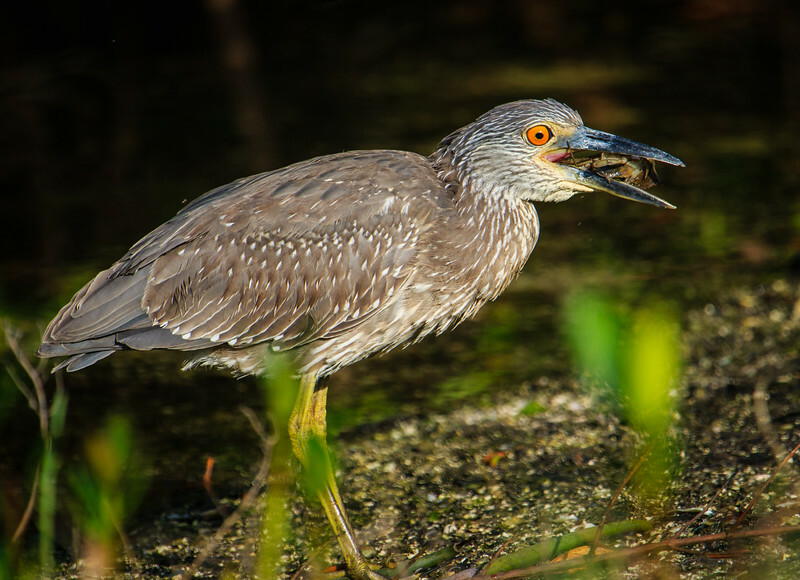 The night herons are active during both night and day, often feeding on small crabs found when the tide is low. 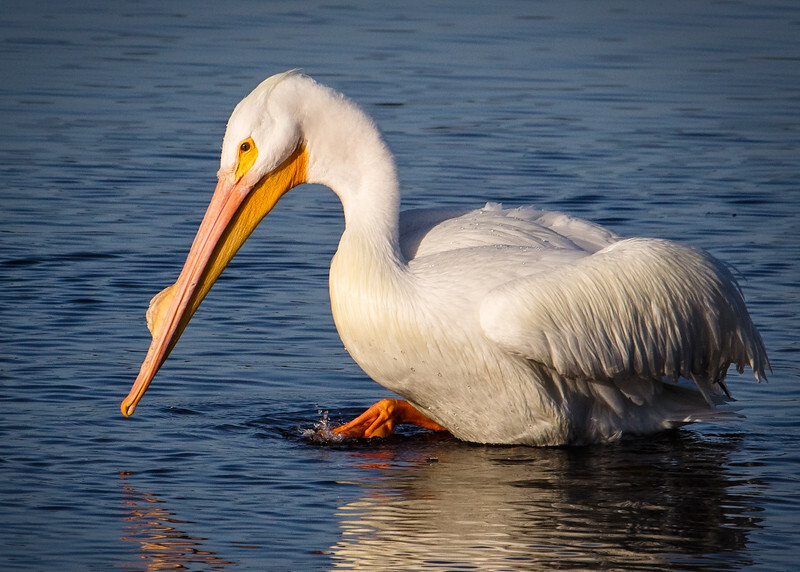 The American White Pelican searches for food while swimming. 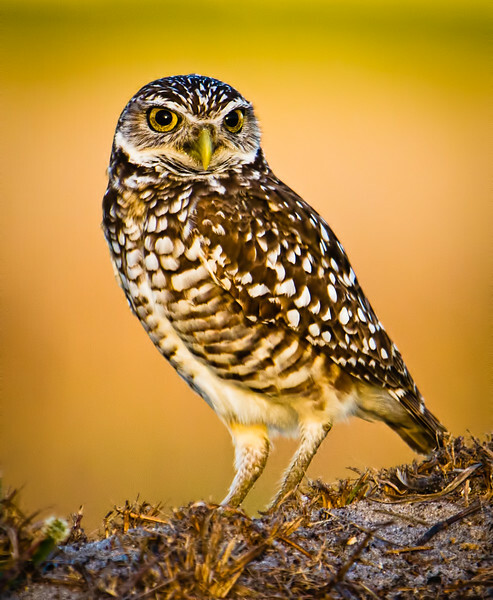 Burrowing owls are native to Southwest Florida. This male was guarding his underground nest, and I used a telephoto lens so as not to get too close. 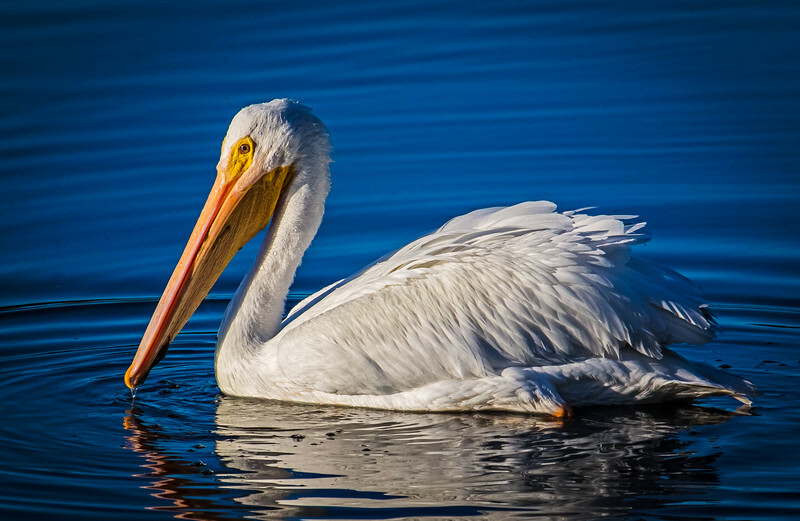 His nest was in a sandy field in a residential area, so he is fairly used to people and comfortable as long as they keep their distance. 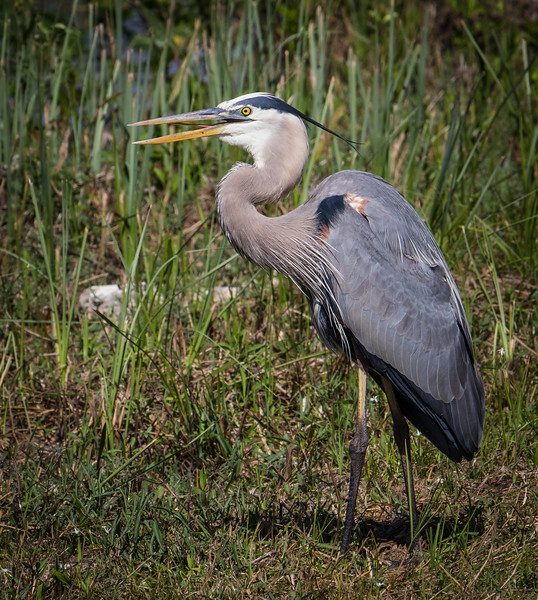 His female partner was in the nest below, and also made a brief appearance while I was there. 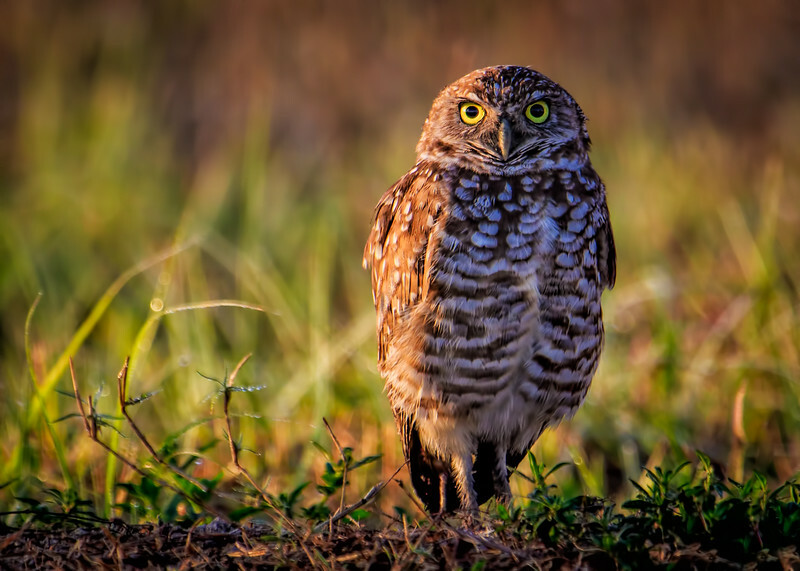 The bright orange and green background was made up of grass that was well blurred and warmed by the early morning sunlight. 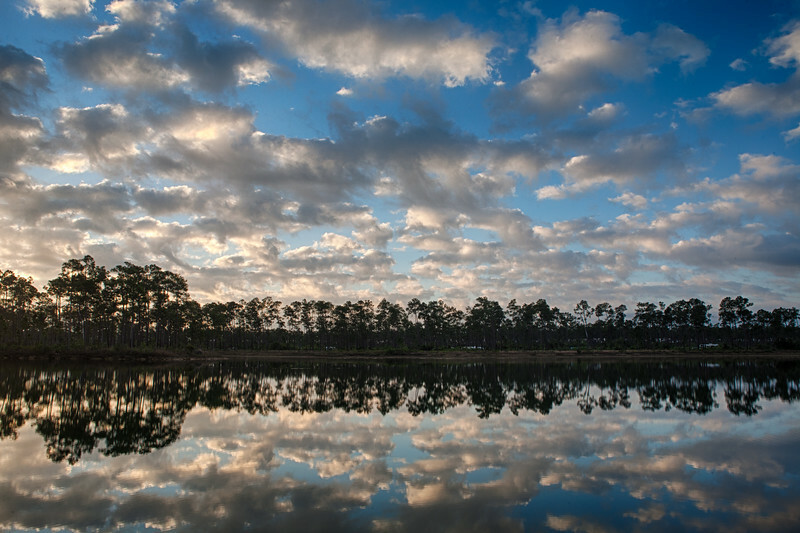 Early morning clouds were quickly chased away by the sun. 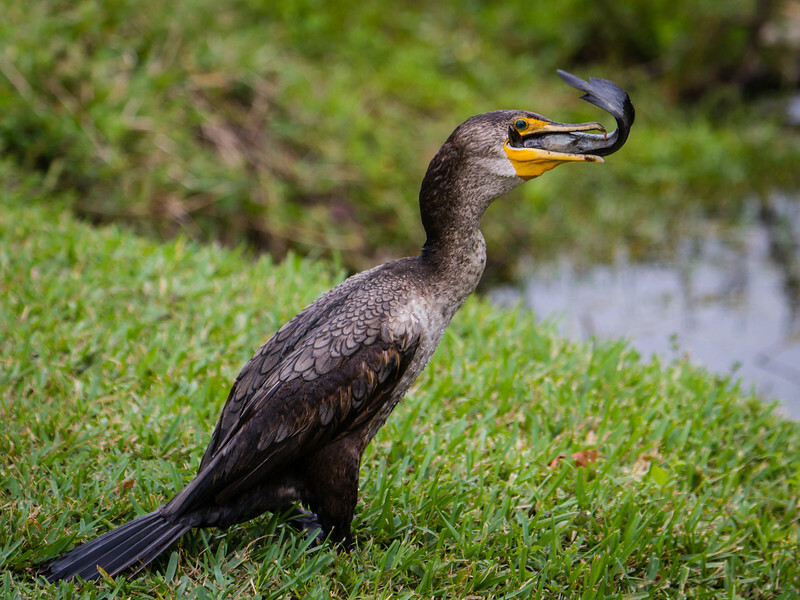 A cormorant makes a meal out of a fish he snagged from the water. It took him a few minutes to swallow the whole fish. 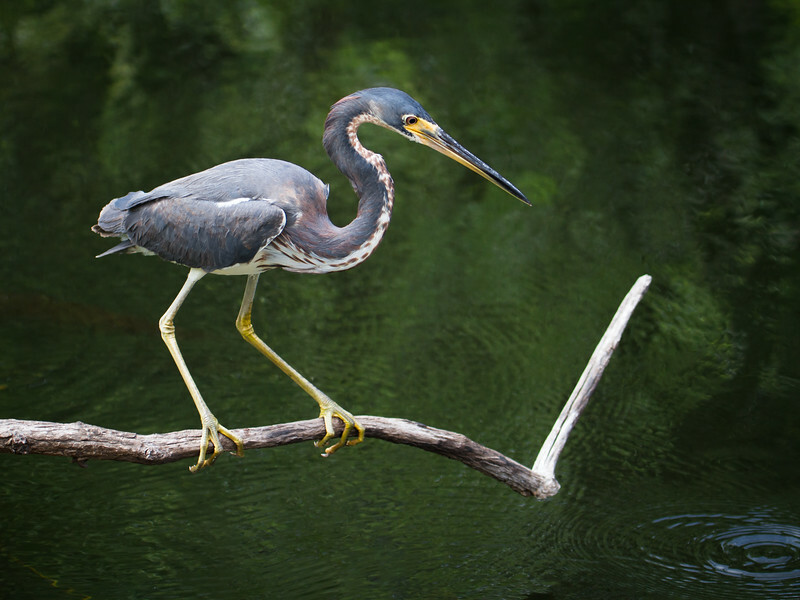 This bird is intent upon catching a fish in the water below. 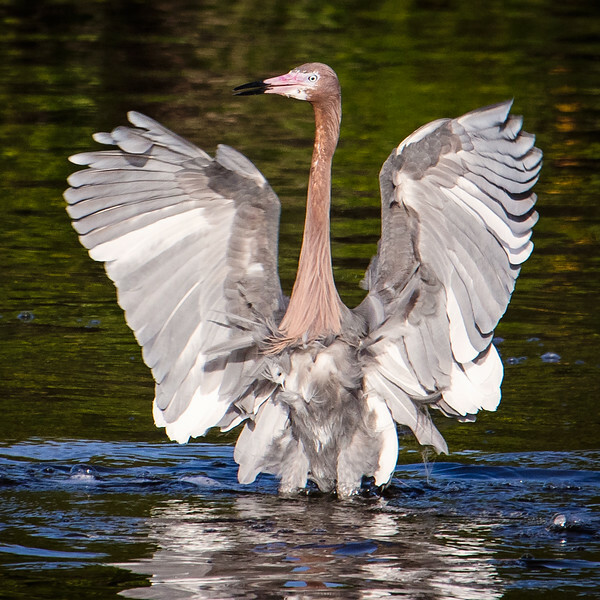 This young blue heron is getting ready to strike at a fish, note the ripples in the water below. 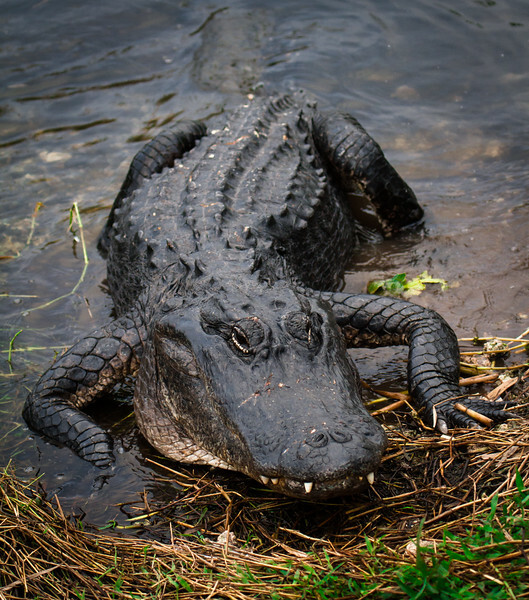 An alligator can move pretty fast when it wants to. This one was just casually making its was out of the water. I was safely standing on a deck above that was built for this kind of observation. 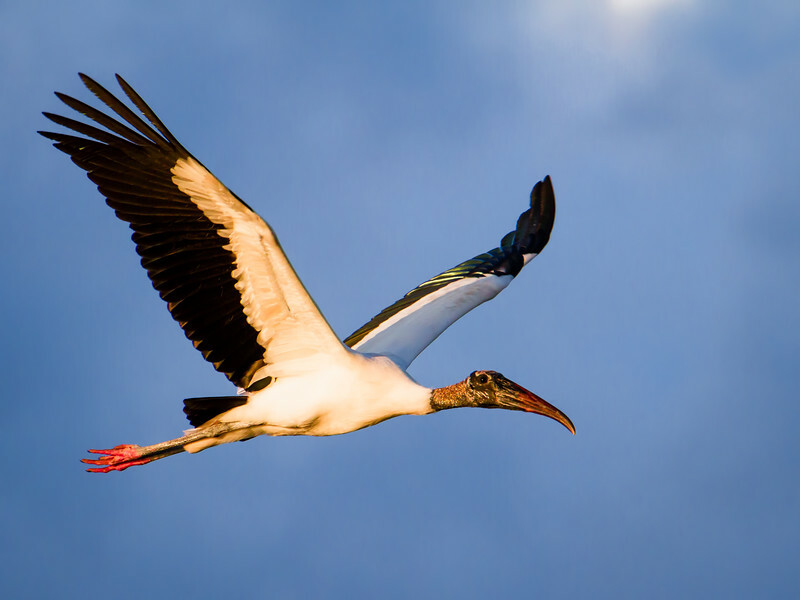 There were quite a few of these wood storks gathering branches to build their nests. This one is probably flying out to find a branch. 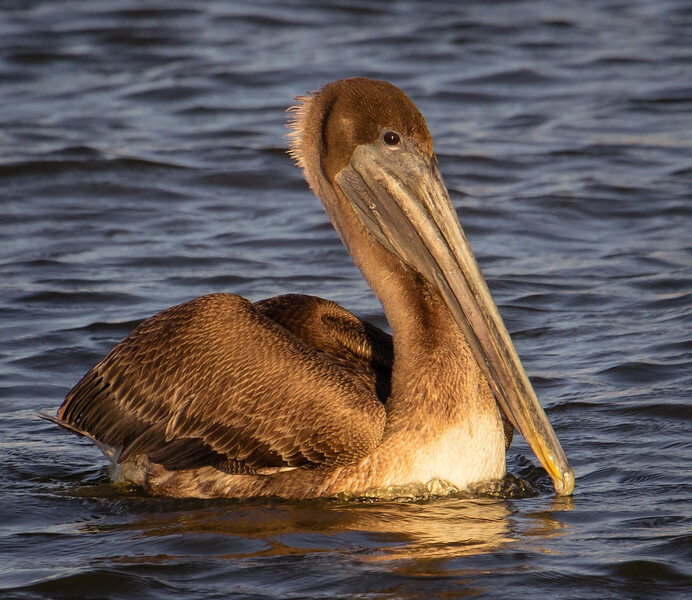 Brown pelicans on the upper right make their way to where they will spend the night. 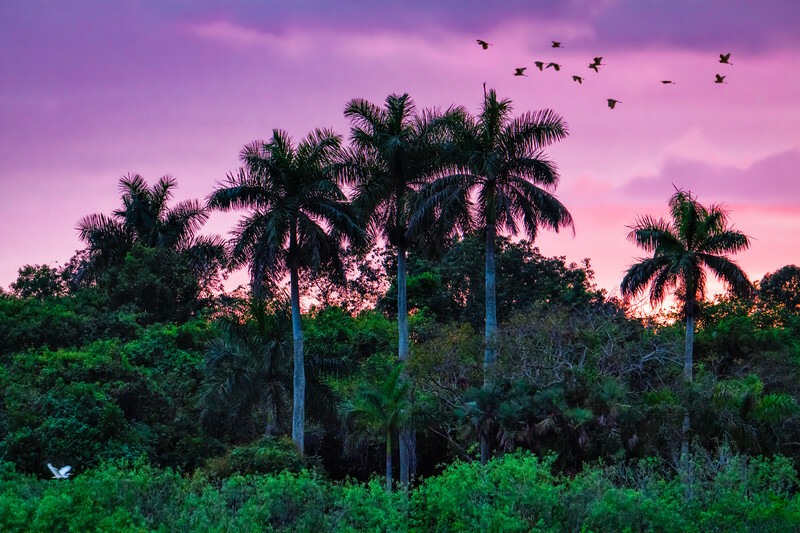 A white egret flies among the branches at the lower left. 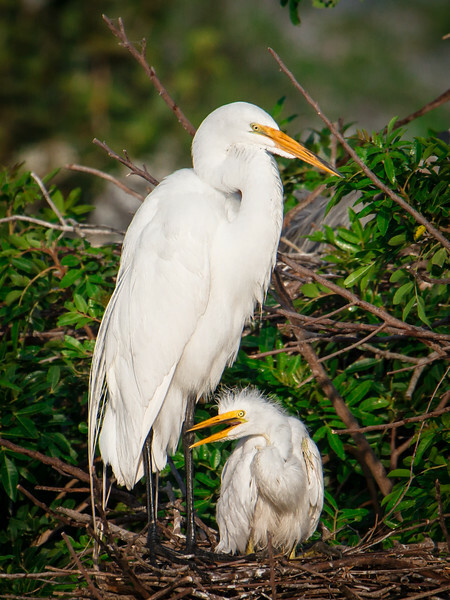 These were found at the Venice Rookery, where a small island allows birds refuge from their predators. 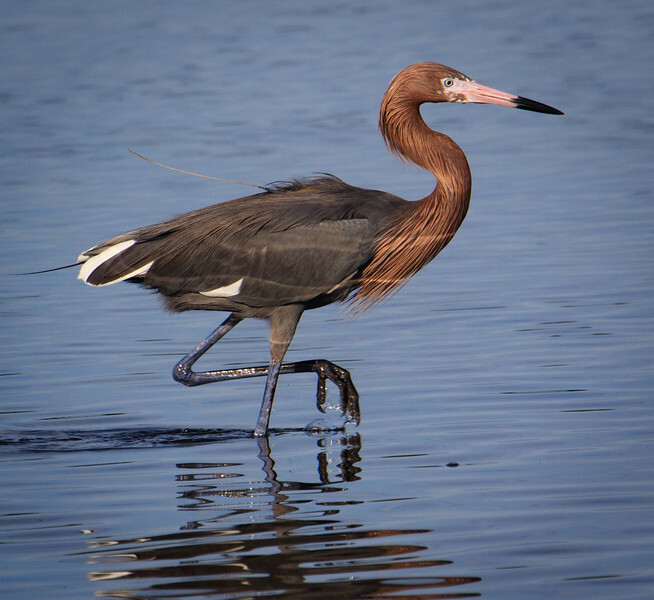 This reddish egret was found at the Ding Darling National Park in Southwest Florida. 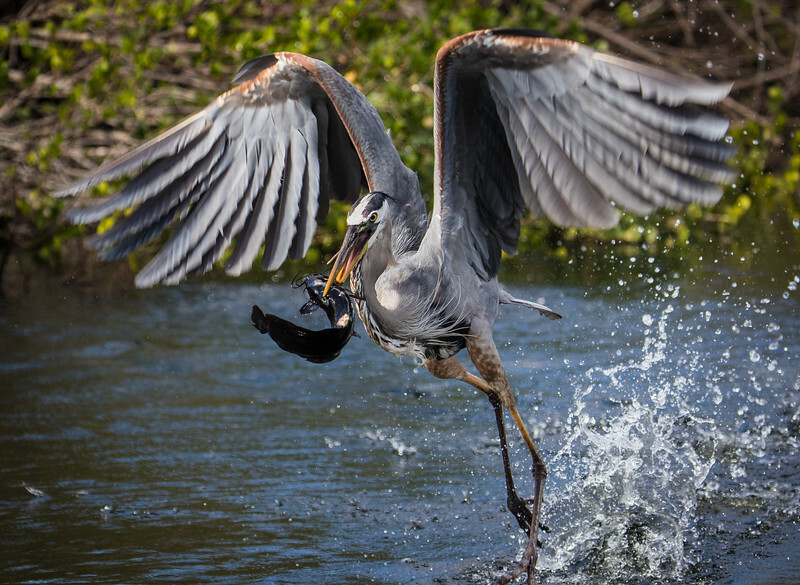 This young heron was happy to find a crab and swallow him whole for a good morning meal at the Ding Darling National Park in Southwest Florida. 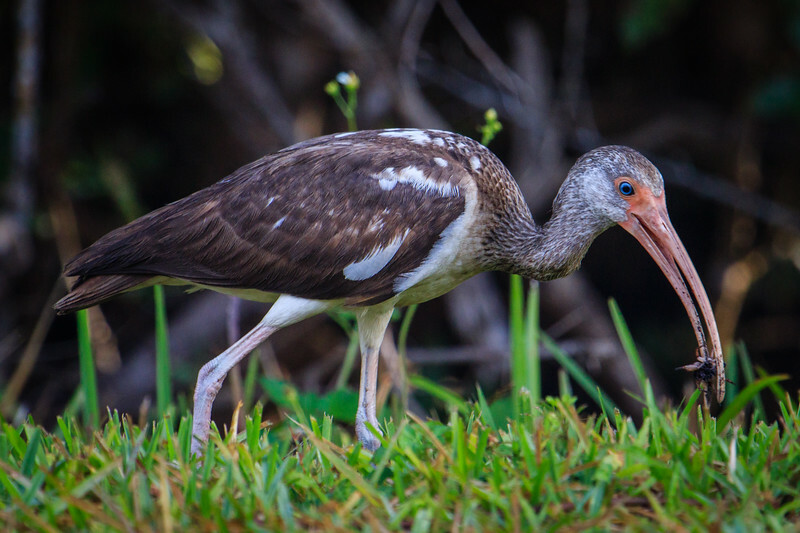 Brown ibis finds a small creature crawling in the grass for a morning meal. He does look like he is smiling, doesn't he? 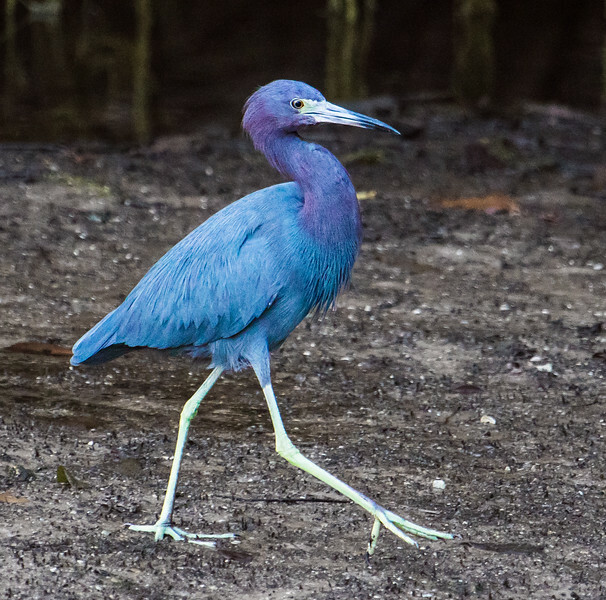 He was actually waiting to cross the road to get from one watery place to another. He was about 10-12 feet long from nose to tail. 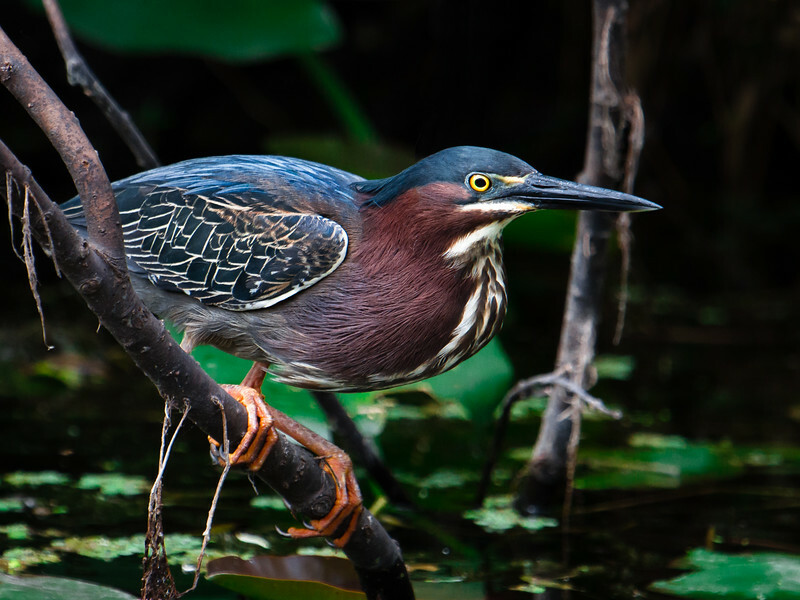 He was hunting for food, but it seemed like he stopped for just a minute to pose for me. 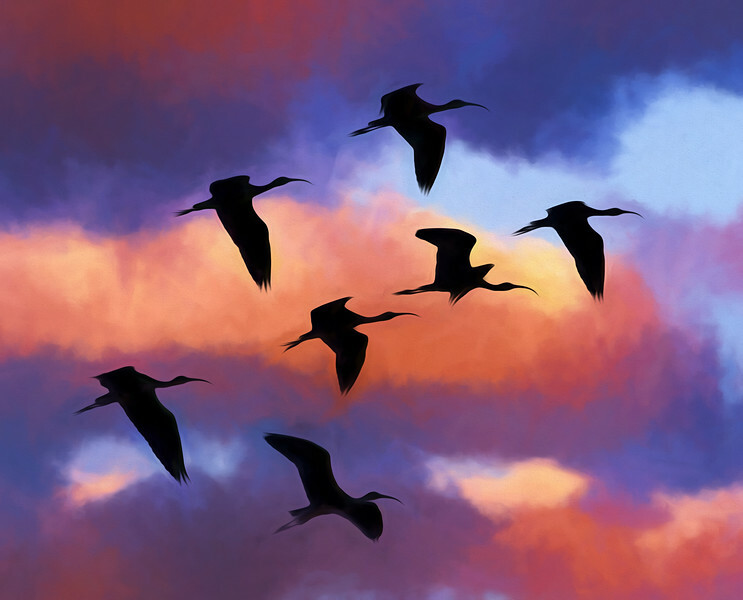 I took some liberties here to combine the bird silhouettes with an earlier sunrise sky and then used photo-editing software to make it look like an oil painting on canvas in the style of Georgia O'Keefe. 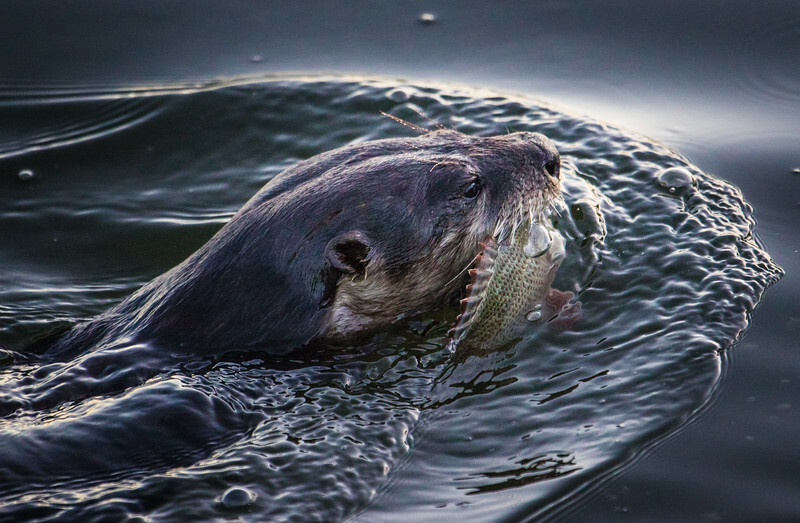 This otter was so fast, he appeared above the water surface for only a few seconds and I was lucky to catch him. I didn't realize he had a fish until after I got home and saw this on my computer!